Inline chlorine generation via electrolysis is revolutionary AIS’ award-winning technology is a Simpler, Safer and Smarter way to disinfect pool water, even at low TDS. It’s time to make the switch from conventional chlorine dosing. Watch these videos to understand why. AIS is passionate about transforming the future of pool water sanitization. Inline chlorine generation via electrolysis delivers all the benefits of clean and bacteria free water without the risks and hassles associated with conventional chlorine dosing. Australian Innovative Systems Pty Ltd (AIS) is an award-winning industry influencer with a 25+ year history of innovation and excellence in the design, production and supply of inline chlorine generation technology via electrolysis. Content of this page allows you to view Augmented Reality video on your phone. Download the free UnifiedAR app from the Apple App Store or Google Play Store. To view, launch the app and point your phone camera at the images. AIS’ vision is for the global aquatic community to have access to safe and perfectly disinfected water while ending the dependence on hazardous chlorine dosing. AIS’ mission is to develop simpler, safer and smarter technologies for water disinfection. NOTHING COMPARES TO THE EVO CS-GEN2 The EVO CS-GEN2 just got even better... It now comes standard with our premium 304 stainless steel chassis and cabinet for the ultimate corrosion protection! lower carbon emissions and lower energy costs. R32 offers higher efficiency and longer pipe runs and requires less refrigerant volume per Kw. This means quicker heating times and less energy used to heat up your pool. Well it’s official – that was the hottest summer ever, and the Bureau of Meteorology is expecting autumn to continue the warmer trend – especially in the eastern states. And despite the floods in Queensland and NSW, it was also a particularly dry summer. For Subscriptions Call: 1800 651 422 Copyright All material in this publication is copyright to the publisher and/or its contributors. No material may be reproduced without the express permission of the publishers. Disclaimer: This publication is published by The Intermedia Group Pty Ltd (the “Publisher”) on behalf of SPASA Australia. Materials in this publication have been created by a variety of different entities and, to the extent permitted by law, the Publisher accepts no liability for materials created by others. All materials should be considered protected by Australian and international intellectual property laws. Unless you are authorised by law or the copyright owner to do so, you may not copy any of the materials. The mention of a product or service, person or company in this publication does not indicate the Publisher’s endorsement. The views expressed in this publication do not necessarily represent the opinion of the Publisher, its agents, company officers or employees. Any use of the information contained in this publication is at the sole risk of the person using that information. The user should make independent enquiries as to the accuracy of the information before relying on that information. All express or implied terms, conditions, warranties, statements, assurances and representations in relation to the Publisher, its publications and its services are expressly excluded save for those conditions and warranties which must be implied under the laws of any State of Australia or the provisions of Division 2 of Part V of the Trade Practices Act 1974 and any statutory modification or re-enactment thereof. To the extent permitted by law, the Publisher will not be liable for any damages including special, exemplary, punitive or consequential damages (including but not limited to economic loss or loss of profit or revenue or loss of opportunity) or indirect loss or damage of any kind arising in contract, tort or otherwise, even if advised of the possibility of such loss of profits or damages. While we use our best endeavours to ensure accuracy of the materials we create, to the extent permitted by law, the Publisher excludes all liability for loss resulting from any inaccuracies or false or misleading statements that may appear in this publication. This issue of SPLASH! magazine published by The Intermedia Group Pty Ltd (Intermedia) may contain magazine or subscription; offers, competitions, forms and surveys (Reader Offers) which require you to provide information about yourself, if you choose to enter or take part in them. If you provide information about yourself to Intermedia, Intermedia will use this information to provide you with the products of services you have requested and may supply your information to contractors that help Intermedia to do this. 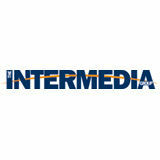 Intermedia will also use your information to inform you of other Intermedia publications, products, services and events. Intermedia may give your information to organisations that are providing special prizes or offers that are clearly associated with the Reader Offer. Unless you tell us not to, we may give your information to other organisations that may use it to inform you about other products, services or events or to give it to other organisations that may use it for this purpose. If you would like to gain access to the information Intermedia holds about you, please contact Intermedia’s Privacy Officer at The Intermedia Group Pty Ltd, PO Box 55, Glebe, NSW 2037. Obviously there are a number of negatives with hot dry weather – drought, water restrictions and bushfires. When topped off with floods it can be doubly devastating. We’ve published some advice from Swimart on page 10 to help with both flooded and bushfire-affected pools. Regardless of the negatives, for the pool and spa industry, hot dry weather usually means increased sales for builders and retailers, and a greater number of service calls for technicians. There is anecdotal evidence of an uptick in the industry and one franchise network at least – Jim’s – had a record number of call outs during the thermometer-busting heat of December. However, the pool DA numbers have yet to show an increase in building approvals. This may just been the lag in numbers which sometimes happens, or it could be due to one or more social economic factors such as pre-election consumer trepidation, continuing low wage growth concerns or the decrease in home equity due to the drop in real estate values. On the positive side, however, all those concerns were in play at the Sydney expo – where two elections are due within the next couple of months and real estate values had taken a noticeable dip – yet there were more consumers than last year and an overall positive mood, with plenty of leads and serious interest. On another note, this issue we say farewell to our longest standing contributor. After four decades in the industry, Cal Stanley has finally decided to retire. We have his last column – and the third part in his story about his time in the industry – on page 24. Thanks for all your valued input Cal! But, as members of this industry know only too well, often when someone retires, you still hear from them on a regular basis. So we can hold out hope for the occasional article in future. Copyright © 2019 - SPASA Australia. The views expressed in this magazine do not necessarily represent those of the above supporters, nor should any product advertised in SPLASH! magazine be seen to be endorsed by the above. 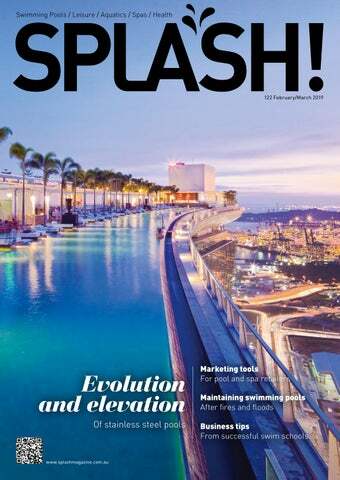 This issue’s cover Cover shows the most famous elevated stainless steel pool in the world, at Marina Bay in Singapore. There is more on stainless steel pool construction on page 46. TUNE YOUR BUSINESS THIS WINTER WITH POOLBOX! PoolBox connects your Point of Sale (POS), Service Management and Water Testing Systems with your MYOB, QBO or Xero Accounting Software. Managing customer relationships is a breeze with PoolBox advanced POS and service management tools: Process customer account payments in POS and directly update your accounts receivable. Enable Batch Billing to group multiple jobs into one consolidated monthly invoice with only a few clicks. Combined service management and water testing gives your technicians the tools they need to provide an even better service to your customers. With real-time business visibility across your operations and with rapid reconciliation tools, PoolBox provides you with all the tools in the box to drive your business. Get your life back and eliminate all the late night administration thatâ&#x20AC;&#x2122;s holding you back! Neptune Pools, the end The third and final part of Cal Stanley’s adventures building concrete swimming pools and his related time in the Australian pool and spa industry. Industry can play leading role in safety promotion Andrew Kidd, Poolwerx chief operating officer, says that the swimming pool and spa industry has an important role to play in promoting safety in and around water. Looking to the future Lindsay McGrath interviews Maytronics CEO Eyal Tryber, asking pertinent questions about innovation, marketing channels, leadership and the future direction of the company. The pool shop toolbox: ideas to help improve retail profitability Izzy Grace looks at the marketing tools that savvy pool and spa companies use to align business goals with a better understanding of their customers, while balancing digital platforms with their bricks-and-mortar presence. 57 Keeping small business cash flow consistent Chris Strode explains how to manage cash flow – the lifeblood of any business – and says without it you’ll be hard-pressed to function. The many ways for swim schools to find success We look at a number of swim schools to find out how they found success, and discover many different routes to a winning outcome – but all requiring dedication, hard work and creative thinking. Pools shine in the best of Houzz Pools featured prominently in many of the Best of Houzz 2019 Awards, especially in the design and photography categories. The evolution and elevation of stainless steel swimming pools One of the pioneers of stainless steel pool construction, Mike Walsh of Natare Corporation, visited Australia as part of a global tour, and met up with SPLASH! to discuss stainless steel, filtration and elevated pools. The modern home that saved the pool The owners of this house wanted a strong modern statement for their new home, but needed the structure to embrace the existing swimming pool. Cleaning and maintaining swimming pools after fires and floods Following the devastating bushfires and floods that have ravaged parts of Australia, pool and spa specialist network Swimart has provided some key information to enable pool owners to help restore healthy water balance. • To start with, it is important to remove as much debris and ash from the pool and ensure the skimmer and pump baskets are clean; • Remove as much debris as possible from the surface of the water with a leaf rake; • Turn the pool pump on to skim any remaining ash and leaves from the surface of the water; • Take a water sample to your local store to be assessed and they will advise what’s required to safely rebalance your pool water and ensure it’s fine for swimming; • The service technician will also advise whether the pool requires flocculant; • If the ash and dirt is substantial, use a liquid or granular flocculant to make the debris and organic matter drop to the floor; • Clean your filtration. For cartridge filters, remove the cartridge and hose it down. Thousands of people have been affected by the devastating floods and heavy rains across Queensland and parts of New South Wales. Swimart has some key tips to help pool owners reclaim and clean their pools – and thus mitigate further damage and eliminate contaminants. “Our thoughts are with those affected,” says Graham. “We understand the number one priority is cleaning out houses and making them habitable, but it must be remembered that flooded swimming pools present a unique set of hazards. “It’s certainly not essential that a pool must be restored to use immediately, but it is vital to assess the condition of the pool and make it safe before starting any work.” The pool shell acts as a kind of ‘boat’ when empty of water. If the surrounding soil is saturated, the pool will have a tendency to float, which can cause it to shift or crack. The available three-monthly pool DA numbers for November-to-January held relatively steady with a drop of one per cent compared to the same period last year. Over the three months, Victoria was up 10 per cent, while Queensland and South Australia were up two per cent. New South Wales was down five per cent and Western Australia was down 18 per cent. Annual figures comparing the 12 months to January showed an improvement of one per cent. South Australia was up 23 per cent and Victoria was up 15 per cent, while New South Wales was down one per cent, Western Australia was down 10 per cent, and Queensland was down 11 per cent. • Check the pump house and other structures in case snakes, spiders and other pests have harboured there; • Remove all debris from the pool including leaves, branches and dirt as this organic matter will create algae issues; • Have a licensed electrician check the circuits and electrical fittings of your pump, timer and any electrical equipment. This may need to be done in consultation with a pool technician in case electrical components need to be replaced; • Consult with a pool technician on how to ‘flocculate’ the pool water. Aluminium sulphate, a flocculant, will cause suspended solids in the water to congeal into a filterable mass and settle to the bottom. The flocculated material should be vacuumed to waste and not filtered, as it will rapidly clog the filter; • Take a water sample to your local pool store for testing and advice; • Test the water pH and aim for a recommended range of 7.2 to 7.6; • If your pool is full of water but isn’t able to be restored, Year new check it daily for evidence of mosquitoes. If mosquitoes and/or larvae are detected, speak to a pool technician about how to remove them; • I f the pool water starts to turn green, an algal bloom is developing and you should consult with a pool technician about how to address this; Jun Jul Aug Sep Oct Nov Dec Jan • Only turn your filter back on once water quality has been restored andYear an new electrician has checked your equipment. While these figures give an indication of the way the market is trending, they are not comprehensive and don’t include all pools built or even all DAs lodged. By some estimates, the total national numbers including all types of pools could be almost double these figures. They do not include pool projects that are approved as part of a new home, smaller projects under the cost threshold, renovations that don’t require a DA, or some aboveground pools. Additionally, not all councils are forthcoming with data or report on time; councils in some states such as Queensland and Victoria are particularly reluctant. For further information, call Cordell Information on 1800 80 60 60.
from regulators on this topic than ever before. “We can’t simply sit back. We’re at the crossroads now it is likely the industry will have imposts placed on it by government or regulators, local and national,” he says. The $46 million swimming lesson promise Federal opposition leader Bill Shorten says if elected his government will spend $46 million over four years to ensure all primary school children have access to swimming lessons. “Aussies love swimming, but too many young people are growing up without learning sufficient water safety skills to keep them safe,” he says. After a late start to the season, Jim’s Pool Care received a record number of customer leads across Australia during December. From 2020 Labor, if elected, plans to fund extra swimming lessons for schools that need it, catch-up lessons for children who require them, support towards transport and pool entry costs, and additional support for children with disabilities to ensure they can participate. Shorten told Basil Zempilas on Sunrise that it's not a federal takeover but he thinks it's time for the national government to use a modest amount of taxpayer money to ensure every child finishes primary school having had the chance to do swimming lessons. "It is going to save lives,” he said. About one in five Australian children leave primary school unable to swim 50 metres. The online stories that made the news over the past two months. New Zealand industry stalwart passes away Sadly, long-time supporter of the swimming pool and spa industry in New Zealand, Geoff Bonham, passed away after a short illness. New Roy Morgan puts pool ownership at nearly 1.1 million pools, close to the general industry estimate of more than 1.2 million. Swimart provided key information to enable pool owners to help restore healthy water balance after recent devastating fires and floods. The Houzz & Home Australia Survey shows half of homeowners on Houzz Australia are planning to renovate their home (57 per cent) at a median spend of $25,000. July 29-30 SPLASH! Pool & Spa Trade Show, Gold Coast Convention & Exhibition Centre More details at splashmagazine.com.au. Dates are subject to change and should be checked with the relevant organisation. Send calendar submissions to info@splashmagazine.com.au. the A-Z of Buying a Pool or Spa session was standing room only. Other popular seminars included talks on pool design, new technology and energy savings, reflecting the consumer desire to do their research before purchase. The next SPASA Australia Pool Spa & Outdoor Living Expo will take place at the Adelaide Showground from March 23 to 24, 2019.
with the exhibitor. It is ultimately consumers who keep our industry thriving, as more pool and spa sales lead to a bigger and better industry.” The next Melbourne expo will be the Spa & Pool Show in August, with the launch of the Backyard & Garden Show to run alongside it. EXPERIENCE THE LUXURY OF TOTAL CONTROL. Introducing the OmniLogic® the simplest, most intuitive pool and spa controller ever. Control lights, temperature and much more, straight from your pocket. Industry moves Tony Blomfield (formerly sales manager for Newline) has moved on from his Pool Systems role as branch manager, Seventeen Mile Rocks. Darryl Barber, Pool Systems general manager, wanted to acknowledge Blomfield’s 15 years in the industry. “Tony is one of the most highly regarded sales people in the industry,” he says. “Knowledgeable, professional, always willing to go the extra mile – and with a dry wit and laugh that burns! He will be a significant loss to Pool Systems. Tony has one of the most loyal personal following of customers in the industry, which is testament to these qualities, and it has been my pleasure to work with him.” Laticrete Australia has appointed George Andriotis as their Victorian and Tasmanian technical sales representative. Andriotis has a number of years’ experience in the retail side of the tiling industry, working with AVJ Ceramics and Tile in Stile in the Dandenong region. He will report directly to national sales manager Ross McNeil. AIS has appointed Chris Chrysostomou as operations manager. He has more than 25 years’ experience in industrial manufacturing and commercial roles, and is an accomplished manager with extensive project, process and reliability engineering experience under his belt. He is charged with accelerating the company’s already rapid business growth worldwide. Jim’s Pool Care now has over 105 mobile pool shops across Australia and with several new sites opening up over the next few months, and Blair says the industry is continuing to grow year by year. “I’m so excited about 2019 and the opportunity for our franchisees and customers, with the release of a range of new innovative pool industry products and equipment,” he says. SMART TECHNOLOGY, BEAUTIFULLY DESIGNED Zodiac’s next generation eXO® chlorinator system is an all in one chlorinator / controller / and water chemistry monitor. Its purpose? To make life for a pool owner easier and more cost effective. Loaded with smart-tech features the Zodiac eXO® puts full control right at their finger tips, saving them time and money. In Brief Controversial senator David Leyonhjelm has been fined $4300 for failing to register his swimming pool. As earlier reported in SPLASH!, he had claimed he was a victim of gender discrimination because he and not his wife was issued with the court attendance notice, yet they were co-owners of the Drummoyne property. He didn’t attend court when Magistrate Eve Wynhausen threw out the defence that council had all the required details and therefore he did not need to register the pool. The magistrate took into consideration his unexplained absence at Burwood Local Court when issuing the penalty, waiting for 45 minutes for him to arrive before fining him $1800 for failing to register the pool and $2500 for the City of Canada Bay’s legal fees. She noted the statewide pool register was designed for the safety of children and that noncompliance could be tragic. Workplace Health and Safety Queensland has issued a safety alert after a concrete pump operator sustained serious injuries when his arm was caught in moving parts within the receiving hopper of a concrete pump. Early investigations indicate the worker was in the process of cleaning inside the concrete pump hopper when a moving component activated and seriously injured his arm. Investigations are continuing. WH&SQ says workers who stand in or place parts of their body in hoppers are at risk of serious injury and should avoid placing any part of their body within the hopper and that a risk assessment should be performed and documented so that adequate controls are implemented to control the risks associated with cleaning the hopper. away from its focus on product and price, and concentrate more on the client experience. The logo and the visual aspects of a brand are the first thing clients see when interacting with a company, so it’s important that those elements have been designed to give the right impression and representation of the company. “Our final design is the result of hard work and thorough research,” says Meyer. “It truly represents Narellan Pools’ position as a global leading brand, while maintaining our focus on our clients and supporting local communities.” He says the design communicates trust and portrays professionalism, while remaining approachable to clients. “The changes to our brand are not just about a new logo, but across the board in our marketing we are aligning our brand to our strategy with a focus on the client experience in everything we do,” he says. WhatWhat if weiftold we told you you we could we could increase increase youryour revenue revenue by 30-40%, by 30-40%, reduce reduce youryourWhen When you you add add a Remco a Remco product product to your to your poolpool construction construction you you can earn can earn up up customers customers water water and and energy energy costscosts by up byto up70% to 70% and and guarantee guarantee a head a head to 40% to 40% more more revenue revenue by increasing by increasing the scope the scope of the of project. the project. YourYour customers customers What if we told you we could increase your revenue by 30-40%, reduce your When you add a Remco product to your pool construction you can earn up turning turning finished finished product product that that will have will have theirtheir entire entire neigbourhood neigbourhood talking. talking. will also will also get to getenjoy to enjoy all the all good the good things things about about a pool a pool withwith far less far less cleaning cleaning customers water and energy costs by up to 70% and guarantee a head to 40% more revenue by increasing the scope of the project. Your customers and and heating heating costscosts and and can can rest rest assured assured theythey havehave one one of the of safest the safest turning finished product that will have their neigbourhood talking. will also get to enjoy all the good things about a pool with far less cleaning Remco Remco has has been been manufacturing manufacturing high high quality quality poolentire pool covers covers for over for over 30 years, 30 years, products products on the on market. the market. and heating costs and can rest assured they have one of the safest leading leading the way the way with with a range a range of European of European style, style, award-winning award-winning products products to to Remco has been manufacturing high quality pool covers for over 30 years, products onto thefind market. meetmeet every every need need and every budget. Contact Remco Remco to find out what out what we can we can do for doyou, for you, and and youryour customers. customers. leading the wayand withevery abudget. range of European style, award-winning products toContact meet every need and every budget. Contact Remco to find out what we can do for you, and your customers. until the new board can hire a full-time, permanent CEO; and Mock has agreed to serve as The Pool & Hot Tub Foundation’s interim Executive Director. The new unified Board of Directors plans to hold its first, organisational meeting in midMarch to begin the longer term process of integration, with the goal of beginning the search for a permanent CEO, determining staffing requirements and locations for core services and programs. Integration efforts are expected to continue through 2019. New program for women leaders SPASA Australia has launched a program to assist women succeed in the pool and spa industry. business or work for themselves, with this option allowing them greater control over their work and family commitments. Maytronics is sponsoring the Women in Leadership Program and it will be facilitated by Ros Ronning, a business executive with more than 25 years’ experience in learning and development, and human resources. She has coached directors, CEOs and senior executives in organisational change initiatives, leadership development, change resilience, performance management, managerial effectiveness, corporate communications, interpersonal skills, and cultural change. eginning in the 1990s, I found more and more pools being installed on building sites, very often with the concrete shell going in before the house even commenced. Pools were being constructed right on the boundary or with the pool wall being part of the house foundation. From 1995 I found myself dealing with architects and builders on virtually every pool and by 2000 I had a number of those highend builders and architects who would simply advise their clients that Neptune Pools would be building their pools – I had virtually no competition at all for the last eight or nine years. were not happy when I had to say: “Sorry, but it was not in the contract and it’s too late now.” Finally, many architects have a warped sense for the size and location of the pool equipment. This became almost the first thing I would look for in a set of plans. Invariably it was far too small and difficult to access. They also have no concept of the size and width required for the balance tank (collection pond) on a vanishing edge pool. All these things need to be ironed out before any pool building commences and ideally before any final price is agreed on. Within weeks, I joined the then Swimming Pool Industry Association of WA (SPIAWA). Within 12 months I joined the managing committee and except for a period of two years, remained a committee member for 38 years. I represented SPASA WA at the national level on CASPA, (the Council of Australian Swimming Pool Associations), was involved in the creation and demise of the first national SPASA, became president – and then had to place it into liquidation. I again represented SPASA WA at the national level when the current SPASA started out as an unincorporated association of state SPASAs. This body transitioned into the current SPASA Australia Ltd wherein I ceased my involvement at the time of the SPASA NSW/SPASA Australia split because I believed in and agreed with their reasons for doing so. By the time you read this, due largely to health issues, I will have finally retired after more than 38 wonderful and enjoyable (most of the time anyway) years in the pool industry. At the ripe old age of 78 it is time for someone else to fill any void I leave behind. Having said that, I remain available to any SPASA member in WA or Australia who may want advice on any topic which they think I may be able to offer advice or assistance on. The pool industry is great – life is better. Thanks! n SPASA CEO Lindsay McGrath says that Stanley has been a prolific supporter and proactive advocate for the growth and promotion of the industry. "He's a straight shooter who's never afraid of picking up the phone and providing an open and heartfelt opinion - often when I needed to hear just that. On behalf of a grateful industry we wish the best for Cal in his retirement." SPLASH! can inform readers that the operation was indeed a success and the new supercharged version of Cal Stanley is spending plenty of time belting balls around the tennis court. SPLASH! is grateful for his time and effort in providing dozens of informative, engaging and thought-provoking articles. Thanks Cal! Thinking of selling your business? SWIMART has qualified buyers! GET IN TOUCH to find out more. echnological, cultural and economic changes are shifting the retail balance of power – and now store owners are becoming more agile when it comes to taking care of existing customers and attracting new ones. For example, retailers can now easily track customer data, which provides an important source of consumer research that product manufacturers can’t directly access. But what’s the point of collating data if you don’t know what to do with it? We look at the modern marketing tools savvy pool and spa companies are using to align business goals with a better understanding of their customers, as well as balancing digital platforms with a bricks and mortar presence. Customers asking for chlorine-free pools? The best solution for your customers with allergies, skin conditions or who just want a healthier lifestyle. The Future of Water Testing Super fast and simple—results in 30 to 60 seconds Stand-Alone or Cloud-Ready Seamless integration with DataMate Web Ready To Go Anywhere, designed for... § Pool Operators § Service Technicians § Retail Professionals Learn More! ALLCHLOR S3800 Allchlor’s brand new chlorinator is modern, sleek and turning the clock back to a simpler era. 100% made in Australia and assembled at Allchlor, the S3800 culminates four year of intense research and development working with the Pool trade. The S3800 is changing the way retail customers buy a salt water chlorinator. The simplicity and functionality takes the guess work out of the what to buy. With Sizing from 25G up to small commercial 60G systems. HARNESS THE FREE ENERGY OF THE SUN Solar heating is the most environmentally friendly way to heat your swimming pool. Whilst performance is reliant on seasonal conditions, solar remains the ultimate in low emission pool heating. Solar systems may vary, but the principal remains the same. Pool water is circulated through a series of tubes or panels (the collector), usually mounted on the roof, where heat is absorbed from the suns free energy and the heated water is then returned to the pool. The amount of heat absorbed and the subsequent increase in pool temperature depends on the system design, size of collector, and the type of control system used. has a fresh new look! Our new look is driven by our passion to deliver the ultimate client experience. It’s modern, contemporary and represents the innovative progressive brand we are. Our look has changed but we’re still the same global market leader with a strong focus on our clients and local communities. pool system married to the additional water purification of Ozone Swim. The system works beautifully with Dolphin robotic pool cleaners to provide swimming experiences in crystal clear, safe and healthy water,” he says. • Payroll, annual leave etc; • Staying on top of cashflow. Dassakis says if your pool or spa store has won an award, that fact can provide a small business with powerful marketing advantages. Winning an award enables you to: • Shine above your competitors; • Be positioned as the best of the best; • Obtain recognition of your efforts; • Celebrate awards with your staff; • Showcase projects and your commitment to excellence; • Generate positive media coverage. customer retention rates and helps with customer acquisition as well through positive word-of-mouth. We also provide consumables and spa parts at very affordable prices. Other customer acquisition strategies include digital advertising, trade shows, and our showrooms.” Spa World has also expanded its offering to include infrared saunas from Vortex Spas. “Which means there is not much of an off season for our company. We also have a number of brand offerings from US-made Viking Spas, winners of the Consumer Digest Best Buy award, the world’s largest selling spa brand HotSpring Spas,” he says. Spa World’s digital-first strategy is optimised regularly to ensure its advertising methods dovetail with its business strategy. “Digital allows us to more accurately target potential customers, measure the effectiveness of our marketing, and smartly allocate our budget,” he says. Join us for a combined one-day trade and two-day consumer expo exclusively focused on pools, spas and outdoor living spaces, all under one roof! 3-5 May ASB Showgrounds, Auckland You are invited to be part of the biggest industry event of the year The New Zealand Pool Spa and Outdoor Living Expo is a combined one-day trade and two-day consumer event, which will generate hundreds of leads for exhibitors over the three days. Put your sales people in front of qualified buyers and generate new business and sales to help fill your order books for months after the event. largest specialist pool equipment distributors and manufacturers in the world. But by 1992 they realised that doing everything was too much for one company, so they divided into two entities – one was the residential catalogue side of the business, the other was the manufacturing and commercial equipment side of the businesses. “Natare was formed to be the commercial systems manufacturer and to concentrate on stainless steel pools, PVC membrane systems and filtration equipment. Stainless steel pools grew out of our stainless steel perimeter gutter. Which is something that’s not particularly prevalent in Australia but we hope to change that. We – and a couple of other companies in the US – developed it in the late 60s/early 70s as a renovation system.” At that point the US had thousands of very old, very large pools that had been built by the employmentgenerating Works Progress Administration (WPA) during the Great Depression. As a result, they made a very significant investment of millions of dollars in equipment, and started making and marketing stainless steel pools. The 1-hour webinars will present the skills and knowledge forming the foundations of leadership. Some of the topics covered include: Your role as a leader, How to create the conditions for success, How to lead in the moment, Manage expectations of others, and How to harness your personal power to influence others effectively. You will also have the opportunity to interact with likeminded successful women in the industry; where we can share thoughts, concerns and challenges around being in a leadership role. The 1-day workshops and forums will be held in a range of locations and will provide a face-to-face environment where participants will expand their learning and dig deeper into the skills required and issues faced in the workplace. The facilitator for the Women in Leadership will be Ros Ronning, a business executive with over 25 yearsâ&#x20AC;&#x2122; experience specialising in Learning & Development and Human Resources. Ros has coached directors, CEOs and senior executives in organisational change initiatives, leadership development, change resilience, performance management, managerial effectiveness, corporate communications, interpersonal skills, and cultural change. he owners of this house wanted a strong modern statement for their new home, but needed the structure to embrace the existing swimming pool. The designers came up with a concrete home that satisfied their requirements and made the pool the focus of the new indoor/ outdoor space. SPASA Australia presents the 2019 Leadership Convention, with internationally acclaimed speakers set to inspire and motivate, and culminating in the celebration of the everpopular National Awards of Excellence. Valued at $1,160, secure your booking and save! Limited to the first 100 registrants, this package entitles you to attend not only the Leadership Convention and National Awards of Excellence, you also gain access to the exclusive Roof Top Networking event, being held on Thursday 1 August. Conversely, identifying your busiest periods means you can try to maximise your profits when you have the biggest projects. Fixed costs will be there all year round, so the more money you can put away during your biggest-paying projects, the better. Putting money away while you’re at your busiest will minimise the impact of seasonality for your business. ash flow is the lifeblood of any business, and without it, you’ll be hard-pressed to function. As a small business owner, it’s important you have enough cash to support your business and yourself through significant and sometimes unexpected expenses, as well as quiet periods and annual leave. While cash flow can suffer due to any number of things, one thing that can make it all-the-more unpredictable is waiting on payments from slow clients. In fact, small businesses tend to be the last to get paid, especially when the invoice is quite a large sum. This can hurt cash flow and put you in a sticky situation during slow periods. Think about the best ways you can keep customers engaged after you do business with them. This could be occasional email updates about your latest projects, or tips to keep their pool or spa in the best condition possible. First, it’s necessary to study and understand how your business ebbs and flows over the course of a year. Analysing slow periods can help guide you when it comes to planning major expenses, acquiring more equipment or scheduling larger projects. Be a superhero to your kids, says new council pool campaign The City of Canterbury Bankstown has launched a new campaign aimed at encouraging parents and carers to be their child’s superhero by activating their “super-vision” when visiting leisure and aquatic centres. The campaign is focused on ensuring parents know they are primarily responsible for their child’s safety when at a local pool, and reiterating the role of lifeguards. “Lifeguards are an important safety feature at our centres, but they do not replace the close and active supervision of parents/guardians,” says City of Canterbury Bankstown Mayor Khal Asfour. “Not all superheroes wear capes and that is what we want to try and emphasise with this campaign, that parents and carers play a vital role in protecting their children from drowning. “We want kids to know they will be kept safe because they have their own “superhero” looking out for them at all times.” Asfour says the startling statistics around drowning was a large factor in kick-starting the campaign. “It only takes seconds for a child to drown. Not one minute, not ten minutes, seconds,” he says. “According to the Royal Life Saving Society, drowning is the leading cause of death in children under the age of five, and a lack of direct supervision by a parent of carer is believed to be a contributing factor in 70 per cent of all drowning deaths at public pools.” Over the past 25 years, 965 children under the age of five have died from drowning. “That’s 965 lives gone in a flash, and thousands more family and friends’ lives ruined,” he said. He says they are running a great campaign, and encourage parents/guardians and their children to have some fun with it – while staying swim smart and swim safe of course. The campaign includes life-size superhero cut-outs and 300 give-aways of limited edition red towels with the Super Vision theme. The campaign complements the council’s Keep Watch @ Public Pools Policy, which is: • For 0-5 year olds and non-swimmers, a parent or guardian must be in the water at all times (within arm’s reach) of the child; • For 6-10 year olds, a parent should be close enough to make eye contact with the child; and •For 11-14 year olds, a parent must regularly check on their child by physically going to the point where they are in or around the water. Contact: cb.city/leisure. Pool and Leisure Centre, the only public pool servicing West Auckland, leaked and flooded the wave pool area, plant room and main reception. As a result, the wave pool, paddling pool, family and adult spa areas were closed off to repair the damage. A judge dismissed indictments against three individuals and two corporate affiliates of Schlitterbahn, the company that built the 17-story Verruckt water slide in Kansas City. The Kansas City Star reports that a judge said the Kansas Attorney General ‘irreparably tainted’ a grand jury with prejudicial evidence to obtain indictments against several Schlitterbahn employees and associates involved in the design, construction and operation of a water slide that killed a 10-year-old boy in 2016. Judge Robert Burns then dismissed indictments against three individuals and two corporate affiliates of Schlitterbahn. is the culmination of two years of research into what Melburnians want the pool to be. “It focussing on a diversity of uses and maintains an array of native vegetation – creating an oasis for recreation and a water-focused meeting place for the community. With the city’s population growing by more than 100,000 per year, there is an urgent need for quality open space that caters for active recreational uses,” he says. for swimming alone, with the numbers growing to 550,000 by 2036. The pool utilises a naturally occurring filtered water process, using wetlands and the submerged water plants to filter and sustain clean and clear water. Yarra Riverkeeper Andrew Kelly is a fan of the proposal. “If we want people to protect the Yarra we need people to engage with the river,” he says. Canadian theatrical entertainment behemoth Cirque du Soleil is teaming up with Canadian designer and manufacturer, WhiteWater, to bring an extravagant splash of showbiz to the waterpark world. EcoFINISH’s thermal plastic coatings are applied pneumatically. The raw material is a dry powder that is propelled through a pneumatic applicator and heated onto the substrate. The material dries as it cools, almost instantaneously! The thermal spray applicator was specifically designed to produce a polymeric coating using our aquaBRIGHT and polyFIBRO powders. The coatings are easily applied with our proven installation methods, and the end result is a smooth durable finish that will last for many years to come. ucceeding in the competitive world of running a swim school involves excelling at a number of different skills including technical, financial, marketing and client relationship management. Here we look at a number of swim schools to find out how they found success and discover many different routes to a winning outcome – but all requiring dedication, hard work and creative thinking. We also ask social media expert Loren Bartley to offer some useful advice for promoting swim schools in the online world. community involvement as a way to communicate the swim schools core messages of safety, quality swimming lessons for all, and swimming for life. This ongoing community focus has undoubtedly contributed to the success of both centres. Over the years the business has grown, but the family focus has remained, with community engagement at the heart of both centre’s activities. NSF has tailored programs to different demographics. Popular adult group lessons were introduced in 2018 as a more social and cost-effective alternative to private lessons. Also introduced was the NSF Achievers Program – a subsidised program for children with special needs, providing one-on-one private lessons for less than the usual cost of a group lesson. They recently partnered with a local childcare centre to allow the childcare staff to bring children of timepoor working parents to swimming lessons within the hours they spend with their childcare provider. “At the end of the day it’s all about getting as many children to learn to swim as possible, to keep them as safe as possible,” says Karen Bentley. “It’s up to us to remove as many barriers to participation as we can, and get the message out to the community at every opportunity.” The centres offer aquarobics for all ages and fitness levels, and offer discounted aquarobics for seniors all year round, free aquarobics and public swimming during Seniors Week, free trial Aqua Natal classes to pregnant women, free Aquarobics on International Women’s Day and many other incentives to come and try something new, which is often the push needed to start a new healthy and social habit. Operations manager Terry Spinks says they are providing one of the most important community services there is in this country. “Parents trust us with their children each and every week. Much of our success is down to the trust we have built in the community, by being authentic, by being consistent with our messaging, and by always keeping in mind why we do what we do. “It all comes back to safety,” he says. and started helping in at his successful swim schools, she decided she needed to learn to swim properly. From 1987 she quickly proceeded to a lifeguard certification and then to learn how to train teachers for the rapidly expanding swim school. Julie had trained in developmentally based therapeutic approaches in early childhood education and health, and was shocked to see swim programs where babies and young children were forced and distressed. She sought guidance from the international learn-to-swim community. Virginia Hunt Newman’s book was a refreshing change, as was the guidance of Laurie Lawrence, Forbes and Ursula Carlile, Sharron Crowley and Rob McKay. She could not understand how force had any place in learning to swim, and strongly believed in childcentred approaches and learning through play. After publishing numerous articles on developmentally based approaches, Julie was soon being asked to speak at swimming conferences and in 1995 she presented at her first international conference in Melbourne. She was the Australian delegate to the World Conference in Oaxaca in 1997; and a speaker in Toulouse 1999, Wellington 2008 and Vancouver 2010. The attack on the World Trade Centre prevented her from presenting in Argentina in 2001. She was a major contributor to the two Australian accreditation courses for baby and preschool swimming, a contributing author of the first Austswim manual for infant aquatics and the more recent Swim Australia Teacher of Baby and Toddler Swimming. Since 2014 she contributed to the first curriculum and teacher training program for indigenous Pacific Islander people, Let’s Swim. Julie produced a video on a developmental approach to baby swimming in 1998, and has directly facilitated the accreditation of thousands of swim teachers in Australia, New Zealand, the Middle East and the Pacific. In 2001 the Zancanaros built Hills Swimming, a customised indoor swim centre to cater for children from three months to national swimmers, focussing on world’s best practice in early childhood aquatic education. Of the 2500 students each week more than half are under five, and many have individual learning programs to cater for sensory processing disorders and other learning challenges. The team of 65 at Hills Swimming allows her time to assist national accrediting bodies to raise standards in early swimming. In 2016 Julie was the inaugural inductee into the Australian Swim School Hall of Fame for contribution to swimming education and she has recently been appointed to the board of advisors of the International Swim School Association. Jump! Campbelltown is independently owned and operated by Erin McMullan, her husband Daniel and their three small children and was opened on 15 September 2015. Their open day saw more than 300 people through the site. The initial 90 students increased to more than 250 within six months. sole purpose of promoting water safety and run regular resuscitation and first aid courses for the community. They also attend local preschools as requested to do water safety talks. Erin is a committee member of the Australian Recreation Institute, and the swim school is a member of both Austswim and ASSA. as the algorithms Facebook uses when choosing who to deliver ads to are second to none. “As users of the platform, we give Facebook so much information about ourselves,” she says. “That’s pretty freaky when you think about this as a user, but brilliant when you think about it as a marketer of your swim school. “You can use all of this data to get in front of new potential customers, as well as re-target those who are already aware of your swim school.” Facebook’s Ad targeting algorithms have become so well refined you can target people who live or travel within the catchment area for your swim school and your ads are seen by those most likely to take your desired action. The algorithms look at who has engaged with your business on Facebook, Messenger and Instagram. It also looks at who has visited your website (provided you have the Facebook Pixel installed) or subscribed to your business via email (provided you upload a list of your customers). It then uses this data to build a profile of your ideal customer and goes in search of other Facebook users who have similar interests, behaviours and demographics to show your ads to – a great way to reach new audiences. This means there is little wastage in your budget, because you know you are talking to the right people. For Safety. For Fitness. For Family Fun. Pool glass fencing keeps families safe and looks beautiful, but keeping the glass clean can be time consuming and difficult due to salt and chorine build-up. EnduroShield says its easy-clean protective coating for glass can reduce cleaning time by up to 90 per cent while shielding the glass against staining and etching. Modulartem says their grids have redefined the concept of design for infinity pools, with taut lines reproducing a minimalist appeal not achieved by conventional drain systems. Made in Italy from a special composite acrylic polymer, they come in numerous colours and four styles: Porcelain Stoneware, Marble, Cotto Fiorentino Terracotta, and Teak. Former aquatic centre manager and safety officer, Doug Ward, has developed an innovative new product to reduce the hazards and hard work involved in triple rinsing chemical containers for recycling. His new TripleRinser unit reduces the labour inputs in pool dosing, reduces water waste and minimises contamination of the workplace environment. Jim’s Pool Care has partnered with Maytronics to offer an official Jim’s Robotic Pool Cleaner. Chris Papa, business director at Maytronics Australia, says the premium cleaner has been called one of the best Dolphin pool cleaners ever made, built on a brand new and a highly advanced robotic platform. “Having experienced the physical workout of mixing chlorine, then cleaning many drums to achieve the voluntary ‘triple rinse’ industry standards for drum recycling, I felt there had to be an easier way that eliminated the repetition and the dangers,” he says. “We have known about Jim’s Pool Care for some time and have always had a close relationship with the team, and thought it was about time we collaborated together and got some cool products out to the market,” he says. Maytronics started their journey in 1982 with the invention of a robotic pool cleaner by Peter Rasch from South Africa. Just a year after this invention, Maytronics launched the world’s first domestic and commercial robotic pool cleaners under the Dolphin brand. Today, they celebrate their 35th year as the premier robotic pool cleaning company. The Eco-therm panel is manufactured by Aquatherm Industries in the US, who have been manufacturing pool heating panels for over 30 years, and its fluted design gives more surface area to achieve one of the highest heat transfer ratings in the Australian market. The strategically placed slots in the webbing prevent moisture build up under the collector and allow pressure relief during high winds. Of all the options available to heat your pool, solar energy is the most cost effective and environmentally friendly method available. We are committed to handling your personal information in accordance with the privacy act. offers and or events from SPLASH! Paramount’s custom built in-floor cleaning systems are engineered to automatically clean any pool you design, including floors, steps, benches and spas. Minimising maintenance and maximising enjoyment.